I've been etching new pictures as much as I can, and have finished two that I'm immensely proud of. They are based around the symbolism and legends behind the Scottish and Malawian flags. This week I've been working on a picture featuring tartan that didn't work so well and which will need to be re thought-out and redone. This is annoying, but has reminded me that cutting corners doesn't save time in the long run, and that I need to plan everything on paper first. The etching workshop I taught in Auchtermuchty last weekend went really well, and I was delighted with the pictures people created. I really don't know how I'm going to choose the best ones to enlarge for the exhibition. 19 people braved the rain to come along and learn etching. Everyone standing outside in the drizzle showing off their pictures. 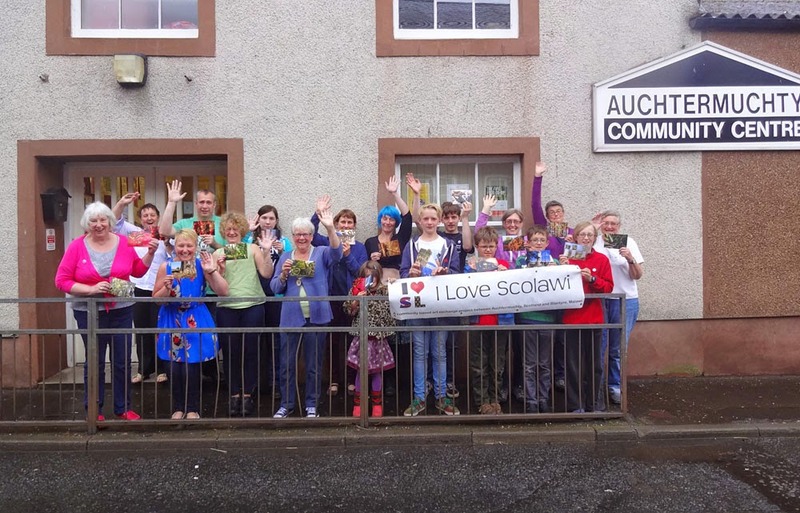 A couple of weeks ago I gave a talk about I Love Scolawi to the Howe of Fife Rotary. They seemed very interested in the project, and delighted that I had taught an etching workshop to the Chimwemwe Children's Centre for street kids while I was in Malawi. Their rotary have raised lots of money for the centre so they could build their own place with space for training and temporary accommodation. Plans are moving on apace for my second trip out to Malawi to exhibit the show. The plane tickets have been bought and I've confirmed my spot at the Lake of Stars festival and at the Blantyre Arts Festival I will also be exhibiting the show to all of the project's participant organisations while I am out there. It will be wonderful to go back and see everyone again because when I was in Malawi last time, I didn't think I would be going back and the goodbyes felt very final. I have spent some time last week putting together a crowdfunding campaign for the workshop and exhibition costs. Crowdfunding is the practice of funding a project or venture by raising many small amounts of money from a large number of people via the Internet, with rewards offered for your contribution. My campaign isn't live just yet, but I hope it will be by the end of this week, and I will send out a quick email to let you know when it's all go. I realise that there are lots of you who have already contributed generously to this project, but there are other ways to help with the campaign like emailing your contacts to spread the word, or sharing my posts on Facebook and twitter so other people hear about the project. Lastly, it was suggested to me that I hold an informal fundraising 'slideshow' evening to show off the photographs I took and talk about the stories behind them. There will be a £5 entrance with a glass of wine beforehand and tea/coffee and cakes afterwards. Does this sound like something you'd like to come to? Could you let me know if you're interested so I can decide whether or not to run it. I've tentatively booked Dunshalt Village Hall for the evening of Saturday 30th August.